A recently university task had us nominate a workplace hero and define that person’s heroic qualities. This exercise provided the opportunity to gain insights into the people who make work a better place. Who Are Our Workplace Heroes? Heroes were described as having inspirational and educational effects in the workplace as well as leading transformation of others’ behaviours – not bad for unsolicited feedback! Today’s workplace heroes are experts at gathering information from their networks, turning it into useable intelligence and sharing it around. The hackneyed ‘working in silos’ approach is dead and heroes encourage those around them to build and share their expertise for the good of the company. Heroes build co-operative attitudes in teams and encourage people around them to contribute in kind. Managers received a lot of praise for acknowledging the efforts of their staff and enabling them to shine. Taking credit for others’ efforts is seen as a short-term tactic that erodes trust and discourages future efforts. The scramble to the top of the corporate ladder can involve a ride up on the backs of others but wise managers today bring their people with them. Remember the corporate vision and mission statement and company values stuck on a noticeboard in a dark hallway and ignored through lack of use? Surprisingly, living and promoting company values ranked highly as a heroic quality. Respondents said that people who lived the company’s values were inspiring because their actions consistently reflected what the company stood for. The company’s value statement wasn’t a faded piece of curled-up paper but was the cornerstone of daily behaviour and decision making. Heroes lived and promoted the company’s positive values and encouraged others around them to do the same. No one can be ‘on’ a hundred per cent of the time, but a positive outlook defined many workplace heroes. Being positive goes long beyond a smile and heroes identify problems to solutions, shun the ‘it’s not my job’ attitude and help others when they can. Several people noted that a positive attitude was contagious and led to improvements in overall workplace culture, particularly during times of uncertainty and change. The same people tend to get lashed with co-ordinating the Christmas party, footy tipping, morning teas and other social events but their efforts were noticed. They were called company ‘heartbeats’ and were lauded for building the people side of business and making their companies a better place to work. As mentioned earlier, most heroic behaviours are regular, everyday actions as we’ve just seen. Anyone can bring a better attitude, share knowledge and get more involved in the company. The more we engage in these positive behaviours, the more we promote and engender them throughout an organisation. The First Person blog wrote about old-school heroes who save the day by taking great risks and pulling off incredible feats, for themselves. These days are over and false heroes such as these don’t have a place in today’s working environments. I worked with a false hero when I was in recruitment. He would promise the perfect candidate to a client, do nothing until the day before the deadline and then harangue consultants for star candidates in the running for other jobs. If he filled the role, he’d crow about ‘saving the client’ at the next weekly meeting, conveniently forgetting about the mayhem caused to other clients and staff. Today’s hero now leads by example with a more solid work ethic and doing the right thing by all stakeholders. What if your workplace is filled with false heroes or managers who don’t want a better culture? Sometimes negative people move on and teams restore their equilibrium, especially if their replacements’ behaviours are more representative of the company’s values. If you are stuck in a toxic workplace or the management layer above supports inappropriate behaviours, sometimes the alternative is to identify opportunities in other departments or consider leaving. Continually doing the right thing can come with the weight of expectations and possibly stress-related conditions in the longer term, particularly in companies that tolerate negative workplace behaviours. Remember to acknowledge, thank and return the favours of your workplace heroes to continue the positive cycles of behaviour. What qualities comprise your workplace heroes? 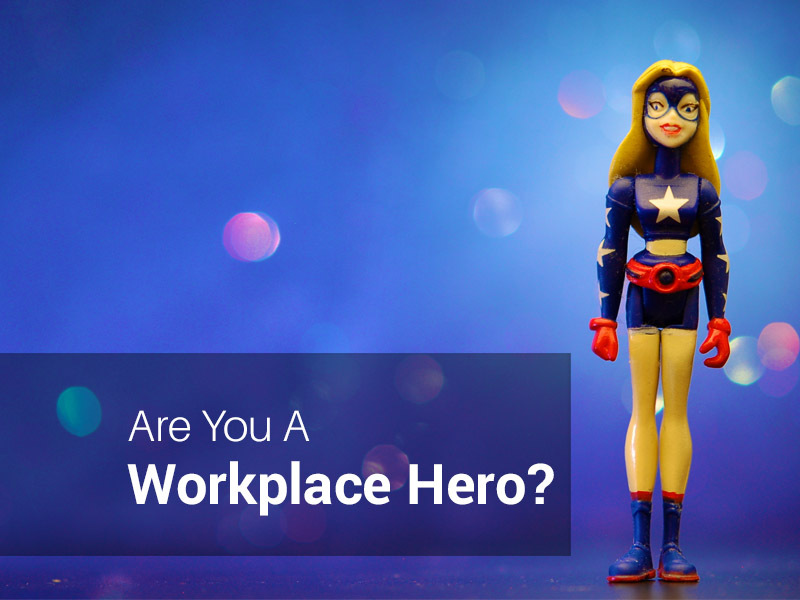 Have you been someone’s workplace hero? How have you handled being a respected professional in a negative working environment?